History on the Hoof brings an authentic and entertaining historical touch to your classroom, special event, festival, or other occasion. 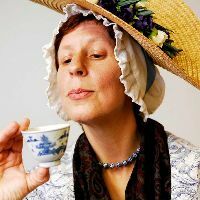 Historical interpreters Stacy Roth and David Emerson engage audiences of all ages through historically-based character portrayals, songs, activities, and/or storytelling. 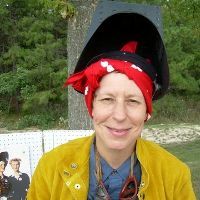 Stacy F. Roth is a freelance historical interpreter, educator, vocalist, and musician (with a background in museums, libraries, archives, and material culture) who combines her talents to create multi-layered presentations that make history accessible and engaging. She holds a BA in History from Kean College of NJ, an MA in American Civilization from the University of Pennsylvania, and an MLS from Rutgers. Ms. Roth is the author of Past Into Present: Effective Techniques for First-Person Historical Interpretation (University of North Carolina Press, 1998). Follow Stacy's Twitter tweets on the topic of Living History at @PastIntoPresent. Stacy is a great enthusiast for New Jersey history and living history events in the State. Together with several colleagues from the museum community, she moderates the Living History New Jersey Facebook page. Looking for the updated appendix of historic sites and museums that feature first-person interpretation from Past Into Present formerly located at www.voicenet.com/~frstprsn/ALHFAM/fpsites.htm? (Voicenet discontinued its hosting services in 2012) Find it HERE. David Emerson makes his living by being a character. 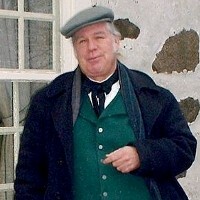 For over 30 years, David has worked at living history museums as an independent storyteller, teaching history through the eyes of a "person of the past." He is a veteran of Colonial Williamsburg, Plimoth Plantation, Morristown National Historical Park, and the Old Barracks Museum. As an Irish Shannachie, David is known for tales that are so convincing “you can almost smell the peat.” David holds a BA in Philosophy from SUNY Oswego, with additional study at Alvescot College, Oxford and the College of William and Mary. 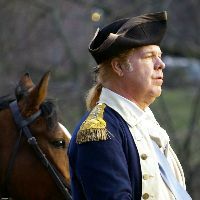 His appearance as Sergeant Matthew Smith in Light A Candle Films' "Battle of Bunker Hill" (2009). David is the chap in the green coat and the striped waistcoat with the New England dialect. and as George Washington in New Jersey Network's "Ten Crucial Days." We are located Central Burlington County, NJ and Lower Bucks County, PA. We travel throughout New Jersey and surrounding states. Follow History on the Hoof on Facebook at www.facebook.com/historyonthehoof. Email preferred for initial contact for clarity of name and number. Photo credits: Stacy with teacup by Andrew Wilkinson of Wilkinson Media, "David MacCaffrey" by Stacy Roth, "Rose Helen Niemiec, Welder" by John Niemiec, David as George Washington by Tim Griscom.